It's just closing up on the fourth anniversary of the forums now. Our girl, she's growing up. We celebrated this year by holding a few competitions in writing, art, and even a competition for the Mod-team's avatars and signatures. We didn't have quite as many entries as I'd hoped, but it was still fun going through all the entries and choosing the best. Well, fun and difficult. Everyone who entered brought something different and interesting to the table, and at times it was a tough choice. We finally came up with our decisions and posted them earlier today. We even rewarded the winners with a superficial and temporary appointment to Tea Part Mod. The writing was the worst to judge. Every single entry was really really good. Masser wrote an interesting action story involving the enslavement of Argonians by other Argonians. Dragour wrote an exceptional piece about a runaway Telvanni wizard that had a really good ending. Vivec's Tears wrote a great poem about Oblivion vs. Morrowind that I found quite amusing. Urthdigger wrote a very funny piece about the Neravarine fighting the head of House Redoran. And finally r brought his usual intelligence and style to the table in the form of an essay written from the point of view of a Mages Guild scholar. If you didn't catch the link before, you can find all of these writings by clicking this link. Regarding signatures and avatars, you can just swing on over to the forum and check out the winning entries for yourself. The winner for signatures was Nyk45 and Nyk also tied with Reaper67 for the avatar win. They're really quite good, so please check them out. While this isn't a competition, it does involve the whole forum. As a bonus to the other festivities we had the idea for Mod interviews. Having no one else to do them for us, we decided to them ourselves. Every mod came up with a series of questions for all the other mods. With five of us, it quickly grew to be a really huge deal and the interviews were huge. In addition, we made a special thread so anyone on the forum could ask us questions. We took those, the tons of questions from the other mods, and compiled them into five in-depth and often very funny interviews. PLEASE, go check these out as they're worth a read. Warning, you'll need some time, so pull up a comfy chair and grab a bowl of crisps and enjoy! And finally there was the art competition. I mention this last because in my opinion, this was the most outstanding entry of all, and I think it deserves special mention. 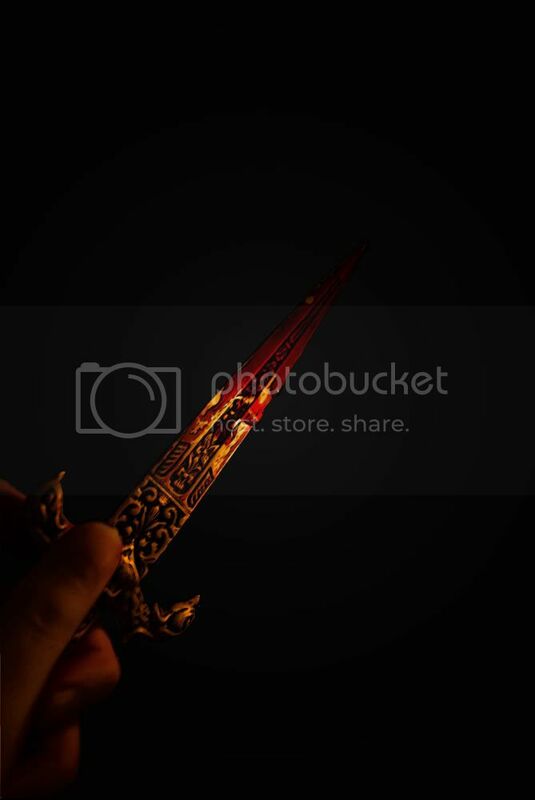 It's a photo taken by user Yeepo and titled "A Knife in the Dark." Hopefully everyone reading this will recognise that reference. You put Vivec’s Tears’ name in the list twice… she’s not that good, is she?